Sorry if I am out of place here, but personally I don’t think you were talking rubbish at all. Your (now edited) comment about the spike that made the candle look like a pin was extremely valid - not necessarily because it was “right” or “wrong” but because it demonstrated the extremely important principle that we should always evaluate what we are looking at! You’re becoming one of my favorite people. Happy trading everyone! This clearly shows that price was rejected hard last month from dropping below the level we are currently sitting at. There is actually a zone of support here that we are trying to drop through. So, when I had my trade ‘stair-stepping down’, I thought I had already broken through support and was in the clear and that it was about to drop, especially after I had that pin bar on the 4hr chart - that is usually a good signal. But now I see it differently. I still think that there is stronger bearish pressure, but I am stuck in the zone. Thanks for that Simon, and that wasn’t the bit I was talking about actually, it was the figures. Ok that spike, As I posted in reall time I was paper trading at the time and went from £12 down to £350 up in a single second, without intermediate prices. Now 1800 is a 31.8% of the entire upswing and I think what happened was this - CPI figures ? the price rose a little but we were at a little below 1810 having been as low as 1804, so I think there were masses of buy orders in the market - from shorts who would cover if it came back up and from longs, looking for a successful re-test. It was great experience being in it in real time and trading it for £700 (even if it was only paper money). The spike was back where it started in 2 hours and I suspect a lot of people lost real money because of it. The fact is that what looks like a fairly decent pin-bar indicator was in fact just a small indecision doji. The pair finshed at 1821 or thereabouts, so the 31.8 has not quite been tested, but in practice, there seems to be no real appetite for pushing lower. That may change on monday when people are looking for new trades, rather than getting out of existing ones on a Friday, but my (Paper) money is going on a reversal, stop at 1726 and the long I already have running I shall raise the stop-loss to 1726 (My entry price) so that will now be a Trade without a loss, which will help ! Further support at 50% 1775 and 61.8% - 1750. So the intention is now two bets running, with loss possible only on one. The trade is not conditional, it will be made at or around 1820 if I can get it. This weekend, over at JSeymour’s trading journal - I discussed my plan of action for USDCAD. You are correct cndlstckchic & also keep in mind that the USD Index has no bearing on NZD as it is not included in the Index. What as in Jesse Livermore ? - That’s a great place to start - but he committed suicide when he was “In control” and didn’t have the Adrenaline rush any more - “reminiscences of a stock operator” - much like “BUZZY SWARTZ” you might not “Like” him very much - but who cares ? Stop Loss for trading - when is too big? Alright, so update on the trades. USDCAD moved up last night and hit my stoploss (which was moved in to positive territory - so not a loss), still not what I was hoping for. Definitely could have done better on this trade if I had set a 1:3 risk/reward ratio. I was attempting to capitalize on a downtrend by pyramiding my trades - but this trend was not stable and price moved against me. With this in mind, I also closed out my USDJPY trades. I feel like a fresh start, and although I have seen the pyramid trading idea turn small accounts into large accounts relatively fast - you do need a solid trend going to make that happen. So, for now back to the 1:3 (or more) risk reward approach. Yet another important issue that you raise here, CC, albeit somewhat indirectly. Many forget, or maybe don’t at first realise, that just getting the direction right is not the only factor in trading, in fact it is only one of many. Pyramiding may be one way of gaining a big boost out of a trade, whereas others may choose to enter with a large position and scale out as the price moves. Some build a position as the price moves with them, other add as the price goes against them. All these alternatives may go right or horribly wrong. It all depends on whether we call the market right or not. These are all based, not on when the move starts, but how long it continues for - and that is impossible to know beforehand. But there are sometimes signs that things are maybe not going according to anticipation that should always raise a red flag. Optimising our results depends perhaps far more on our exit strategy than on our entry point. Risk management may give us provisional levels for target and stop levels but these, of course, should always be refined to the nearest logical levels based on our chart readings. But actual position management, especially exit strategy, is maybe the hardest area to control, but makes all the difference in terms of P/L. I absolutely agree. To be honest, this is not the 1st time that I have encountered this problem, lol…I’m guilty of trying to get the most that I can out of a trade and sometimes that leads me to holding on longer than I should. That thread by @Clint that I recently posted above discusses this issue as well. Shhhhhhhh, it’s a secret. 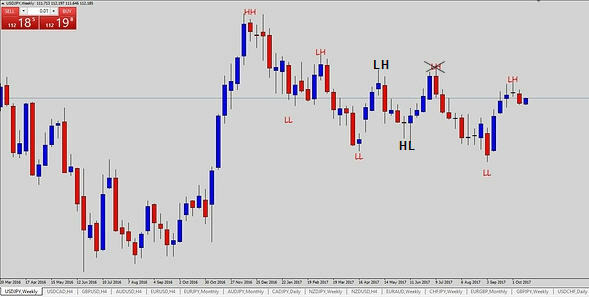 But this is a rangy market right now, very hard to pyramid 40 pips, if you add at lets say 32, well its only 8. You know that in true pyramiding you use only your current profit to pay the margin for another position, just in case, it might help. Oh did I mention it is a rangy market and trend traders will be hacked to pieces. Your sequence went a bit wobbly for 6 weeks in the middle there which would have spoiled your cycle for a while. Hi no worries, but, it is my observation that you are using a textbook definition of trend, and trying to shoehorn recent price action into that definition. On your chart, 10/02/16 - 12/25/16 is a classic, swing traders trend, you can Pyramid it, and you can even let it get a little old and still make a profit. However since ummmm, lets call it the second week of Jan 2017, it moved into a downward sloping channel, it’s not really sloping it is more like slumping, with a massive amount of chop in between. The chop can be seen by the long tails and wicks, when you see that on this fractal it is chop. So if one were to draw some lines on this, tops and bottoms, and since it is kind of slumping down, you take shorts on the high side, you could probably preset them, and leave the longs alone. Right now one would be 2 weeks late to enter a swing short. Oh one more thing, draw a level at the Dec top and the Aug bottom and I think you will find that the price has been floating up and down around the mean of the multi week high and low.